There are many questions you should ask any solar company when exploring solar options. Doing your due diligence before the installation ensures your understanding of quality, workmanship and avoid future problems. We have listed the top questions you should ask before you make your selection. The cost of your solar investment will vary greatly, depending on the size of the system, your location and available incentives. If you don’t already have an installer to help you, go to delsolenergy.com and schedule your free solar consultation. We design and build our systems based on each customer’s unique energy usage, meaning the price per watt you pay might be the same as your neighbor’s – but the cost of the entire system will surely be different because your energy usage is different. Del Sol Energy installed solar systems are eligible for a 30% federal tax credit. Additional state, local, and utility incentives exist in many areas, further lowering the net cost of your investment. Ask a Del Sol Energy “Energy Adviser” about available incentives in your area. Can my electric bill really by $0? That is what our goal is! We design your system to produce slightly more energy than your home utilizes. However, there is typically a standard connection fee homeowner’s must pay annually to keep their homes connected to the electrical gird. And YES – you do have to be connected to the grid. Currently, where we live, we are under a system known as “net metering.” Net metering allows your electricity costs to be reduced to zero. Most new systems that we are not qualified to extra energy production payments outside of “rolling back” your own personal meter. Should my solar system be installed by a licensed contractor? 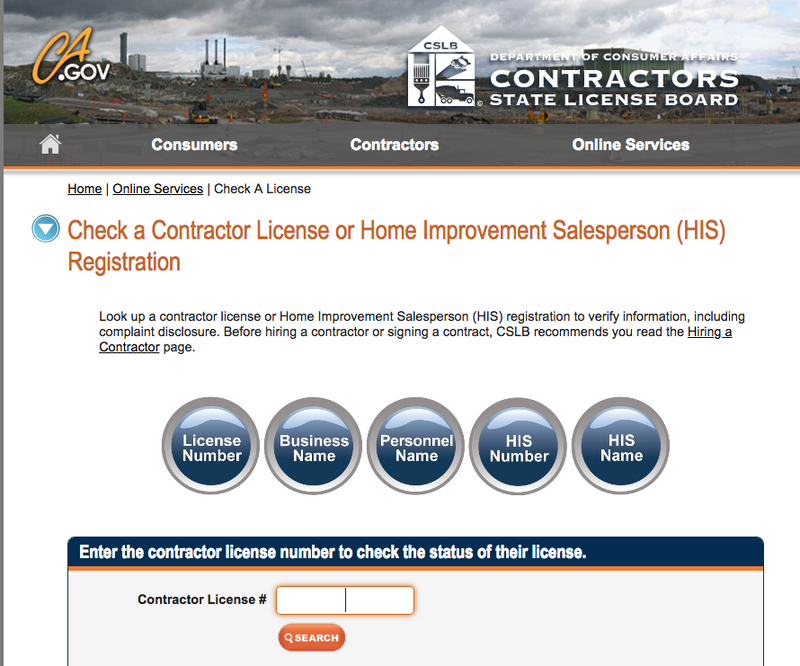 If you don’t see your contractor listed, there is a good chance that they are not licensed to compete work in the California and do not carry the correct insurance. What type of insurance should my solar company carry? Your solar company should carry multiple types of insurance; General Liability and Worker’s Compensation. These two important types of insurance ensure the protection of you and your home as well as the company and the employees of the company. Does a solar system require permits? Yes. This is a construction project and permits are required. However, your Del Sol Energy team will handle all of the paperwork and permitting process to make your experience quick and easy. It is not recommended. The process requires qualified electrical and roofing expertise to ensure the system is safe and optimally designed for 25-plus years of production. With no moving parts and at least a 25-year expected life span, Del Sol Energy installed systems require very little maintenance. In fact, their design ensures that they remain clean and producing optimal amounts of energy. Yes. If your solar panels are in contact with even small amounts of light, they can produce electricity. In fact, given equal sunlight, a solar panel in a cold climate will out-perform a solar panel in a hot climate. Del Sol Energy installed solar panels can withstand high wind and snow loads. Most of the panels we install have been certified for installation near blowing sand, salty air and agriculture. For the safety of workers attempting to fix power outages, solar systems that are connected to the electrical grid are required by utility regulations to shut off during blackouts. Del Sol Energy recommends battery backup in places where blackouts occur regularly. Your Energy Adviser can help you understand which battery storage option is best for your home. If you have an optional battery-backup system installed such as a Tesla Powerwall or an LG Chem, you may be able to power your home entirely on energy produced by your solar system. However, in most residential cases, truly disconnecting from the grid is unrealistic. Additionally, in most of our install areas, it is illegal to be completely disconnected from the grid. Your Del Sol Energy “Energy Adviser” can provide you with the pros and cons of choosing to go off grid. I don’t plan on being in my home for 25 years. Why would I add solar? A solar electric system can still be financially beneficial to you and your family. A solar system will start reducing your electric bills immediately and even pay for itself in as little as five years. Even if you move before your solar investment is completely paid off, studies by the National Renewable Energy Laboratory show the remaining value will likely be returned upon sale of your home. Plus, your home will most likely sell faster. Who doesn’t want a home with a guaranteed low electric bill? Our warranty is even transferrable one time to new owner. When design and installation best practices are followed, your roof will maintain its integrity. Del Sol Energy audits and trains all our install teams on these best practices so that you can rest easy knowing that your roof will be okay. Be sure to ask your Energy Adviser about any guarantees it offers on its installation quality. Similar to any other electrical component, proper installation will greatly limit any dangers. However, you should still take care to ensure your system is not easily accessible by children or animals who could potentially damage the system and possibly injure themselves. If your system becomes damaged in any way, immediately reach out to your Energy Adviser for assistance. Can a solar system be insured? Most often, no. Currently California has Solar Access Laws that provide varying degrees of protection against restrictions anyone – HOA, neighbors or even local government – can place on your solar system. Your local Del Sol Energy “Energy Adviser” will be able to discuss the laws and policies in your area. Can Del Sol Energy’s solar panels heat my pool? YES – we have options for thermal solar panels which will provide assistance in heating your pool. We are also one of few vendors in the Brentwood, Antioch, Oakley, Discovery Bay and Pittsburg that offer CoolPV technology. CoolPV provides thermal heating AND standard PV solar energy production, providing the best of both worlds. If your pool is currently heated, it most likely uses natural gas, so solar electric power will not be able to assist in the heating process. However, our solar panels do offset the power used by a pool’s electric pumps, which has been shows to be the most significant impact of a pool on energy bills. Interested in learning more about solar? Stop by our educational showroom at 225 Oak Street in Brentwood or call us at (925)378-4800.